Non-communicable diseases (NCDs) such as cancer and diabetes are a silent pandemic of our own making and a real threat not only to human health but to global prosperity. 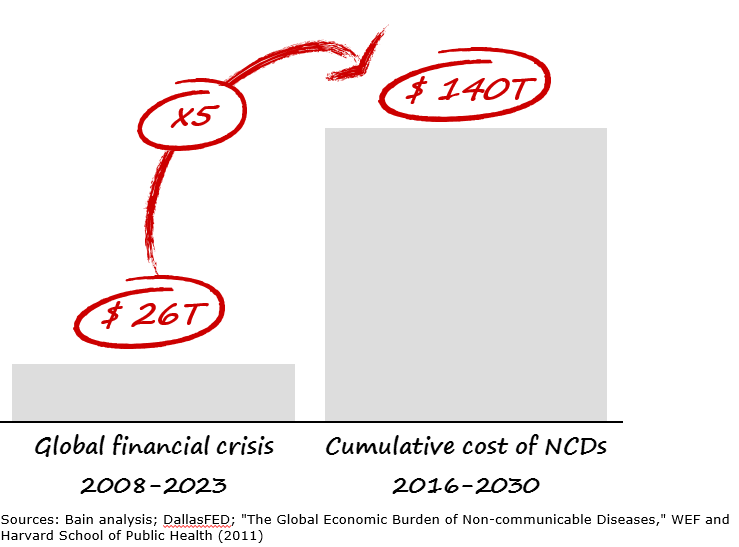 To put this threat into perspective: the cumulative direct and indirect costs of NCDs over the next 15 years will be about five times the costs triggered by the global financial crisis in the 15 years following 2008, according to Bain analysis based on data from the World Economic Forum and Harvard University and the Federal Reserve Bank of Dallas. An ageing global population is one of the main factors. According to a UN paper on ageing, by 2050, 25% of the world’s population will be 60 or older, and 80% of those older people will live in developing countries. However, ageing does not necessarily imply poorer health. The most significant causes of the rise of NCDs are urbanization and industrialization, which are exporting an unhealthy, sedentary and high-stress lifestyle from the West to economies around the world. As most NCDs are chronic diseases, this causes not only medical costs to skyrocket but also produces significant indirect costs, both personal and financial. It is evident that we cannot afford this, and we need to take action. More efficient and effective medical treatment is only part of the answer. Faced with the reality of a rapidly ageing world population, the key to turning the tide on NCDs is to follow the recommendations outlined in Maximizing Healthy Life Years , a joint report of the World Economic Forum and Bain & Company. As indicated in the report, health is not just an issue for stakeholders in the classic healthcare industry; it touches almost all industries. Take, for example, the opportunity to change our view on healthcare spending. Currently, direct health spending is 4% of household consumption expenditure in the EU 28, according to data provided by the OECD. However, when we broaden our thinking, we see that healthy living touches all aspects of our lives: what we eat, where we live and what we do in our free time. With this in mind, based on our analysis, health expenditure of households can reach 80% or more — or €6.2 trillion in the EU 28. 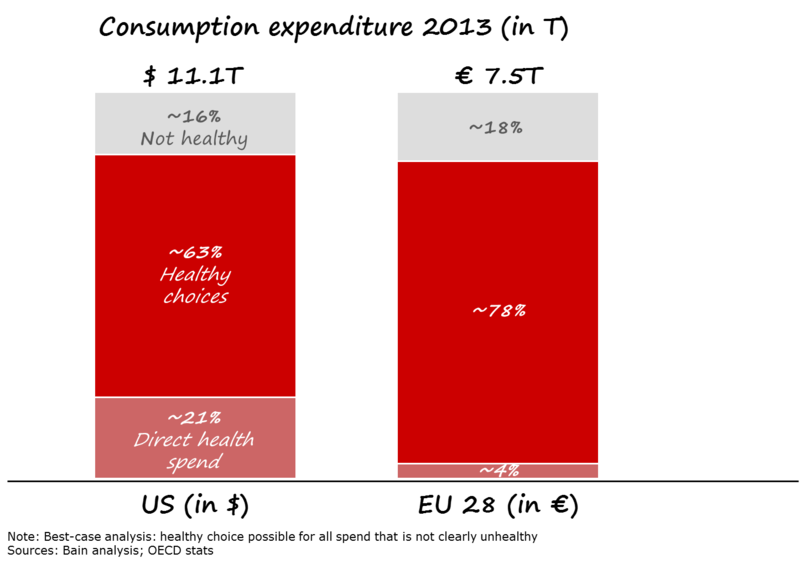 The roughly 78% of health expenditure that is not direct health spending is on products where healthier options are available, ranging from food and housing to clothes and leisure activities. The Forum report, How to Realize Returns on Health , created in collaboration with Bain, offers a way to overcome these hurdles. With regard to incentives, public and private stakeholders need to create “Ecosystems of Health,” where a health benefit (or Return on Health) aligns with Return on Investment. Within these systems other stakeholders can then design and deliver financially viable, health-enabling offerings. For example, transparency around the “health” of certain neighbourhoods allows home buyers and renters to place a direct financial value on, for example, access to parks - in the same way as access to good schools is often included in local real estate prices. A group of researchers from the University of California, Berkeley showed that children who grow up in proximity to parks and recreational resources have a healthier weight later in life. As obesity is a major risk factor for most NCDs, the real estate premiums created by such a “health map” are a direct financial incentive for real estate developers to contribute to the fight against NCDs by integrating more parks into neighborhoods. More parks also create business opportunities for outdoor exercise, such as The Rabble in the UK, where grown-ups meet in outdoor settings to play high-intensity games inspired by their childhood. Subscribers (especially in single-payer systems) can also intervene in areas with below-average health scores by offering prevention programmes like community building to mitigate mental health problems. Many stakeholders acknowledge that they need to act, but most are struggling to get started. If your company is looking to design and deliver healthy offerings, these steps can help you get things off the ground. · Figure out the relevant assets and capabilities you have at hand. For example, consumer goods companies have capabilities around obtaining consumer insights and driving consumer behaviour that are key in creating healthier behaviours. · Match your assets with trends and developments in the relevant ecosystem. There is a wide range of opportunities, starting with the scale of change (from incremental to full transformation into a health company) to geography to which role your business wants to play within the ecosystem. A careful assessment will reveal the most relevant opportunities and potential gaps in the assets and capabilities required to serve these opportunities. Based on this information, companies can develop a roadmap for building or acquiring the required capabilities and rolling out initiatives without overburdening the organization. Initiatives such as the Wellness Valley in Italy are proof that it is possible to create ecosystems of health where healthy offerings are financially viable - either as for-profits, nonprofits or social enterprises. We need courageous, visionary leaders to take the steps outlined above, search for the right allies and start building their own ecosystems of health. Doing so is not only a corporate social responsibility but also the way to future-proof business models.